Little seed Canary grass (Phalaris minor) is a monocot weed in the Poaceae family. In Mexico this weed first evolved resistance to Group A/1 herbicides in 1996 and infests Wheat. Group A/1 herbicides are known as ACCase inhibitors (Inhibition of acetyl CoA carboxylase (ACCase)). Research has shown that these particular biotypes are resistant to clodinafop-propargyl, fenoxaprop-P-ethyl, fluazifop-P-butyl, pinoxaden, sethoxydim, and tralkoxydim and they may be cross-resistant to other Group A/1 herbicides. Irrigated wheat production areas in central highlands in the states of Guanajuato and Michoacan (Fairly widely reported). Field, Greenhouse, and Laboratory trials comparing a known susceptible Little seed Canary grass biotype with this Little seed Canary grass biotype have been used to confirm resistance. For further information on the tests conducted please contact the local weed scientists that provided this information. There is no record of differences in fitness or competitiveness of these resistant biotypes when compared to that of normal susceptible biotypes. If you have any information pertaining to the fitness of Group A/1 resistant Little seed Canary grass from Mexico please update the database. Singh, D. V. ; Kuruba Adeppa ; Krishna Misra. 2012. Mechanism of isoproturon resistance in Phalaris minor: in silico design, synthesis and testing of some novel herbicides for regaining sensitivity. Journal of Molecular Modeling 18 : 1431 - 1445. Isoproturon, 3-p-cumenyl-1 dimethylurea was the only herbicide controlling Phalaris minor, a major weed growing in wheat fields till the early 1980s. Since it has acquired resistance against isoproturon, like other substituted urea herbicides, where the identified target site for isoproturon is in the photosynthetic apparatus at D1 protein of Photosystem-II (PS-II). Nucleotide sequence of susceptible and resistant psbA gene of P. minor has been reported to have four point mutations. During the present work D1 protein of both susceptible and resistant biotypes of P. minor has been modeled. Transmembrane segments of amino acids were predicted by comparing with the nearest homolog of bacterial D1 protein. Volume and area of active site of both susceptible and resistant biotypes has been simulated. Isoproturon was docked at the active site of both, susceptible and resistant D1 proteins. Modeling and simulation of resistance D1 protein indicates that the resistance is due to alteration in secondary structure near the binding site, resulting in loss in cavity area, volume and change in binding position, loss of hydrogen bonds, hydrophobic interaction and complete loss of hydrophobic sites. To regain sensitivity in resistant biotype new derivatives of isoproturon molecules have been proposed, synthesized and tested. Among the 17 derivatives we found that the N-methyl triazole substituted isoproturon is a potential substitute for isoproturon..
Singh, D. V. ; Shikha Agarwal ; Kesharwani, R. K. ; Krishna Misra. 2012. Molecular modeling and computational simulation of the photosystem-II reaction center to address isoproturon resistance in Phalaris minor. Journal of Molecular Modeling 18 : 3903 - 3913. Isoproturon is the only herbicide that can control Phalaris minor, a competitive weed of wheat that developed resistance in 1992. Resistance against isoproturon was reported to be due to a mutation in the psbA gene that encodes the isoproturon-binding D1 protein. Previously in our laboratory, a triazole derivative of isoproturon (TDI) was synthesized and found to be active against both susceptible and resistant biotypes at 0.5 kg/ha but has shown poor specificity. In the present study, both susceptible D1(S), resistant D1(R) and D2 proteins of the PS-II reaction center of P. minor have been modeled and simulated, selecting the crystal structure of PS-II from Thermosynechococcus elongatus (2AXT.pdb) as template. Loop regions were refined, and the complete reaction center D1/D2 was simulated with GROMACS in lipid (1-palmitoyl-2-oleoylglycero-3-phosphoglycerol, POPG) environment along with ligands and cofactor. Both S and R models were energy minimized using steepest decent equilibrated with isotropic pressure coupling and temperature coupling using a Berendsen protocol, and subjected to 1,000 ps of MD simulation. As a result of MD simulation, the best model obtained in lipid environment had five chlorophylls, two plastoquinones, two phenophytins and a bicarbonate ion along with cofactor Fe and oxygen evolving center (OEC). The triazole derivative of isoproturon was used as lead molecule for docking. The best worked out conformation of TDI was chosen for receptor-based de novo ligand design. In silico designed molecules were screened and, as a result, only those molecules that show higher docking and binding energies in comparison to isoproturon and its triazole derivative were proposed for synthesis in order to get more potent, non-resistant and more selective TDI analogs..
Gherekhloo, J. ; Osuna, M. D. ; Prado, R. de. 2012. Biochemical and molecular basis of resistance to ACCase-inhibiting herbicides in Iranian Phalaris minor populations. Weed Research (Oxford) 52 : 367 - 372. Phalaris minor is a common weed in wheat and barley fields of Iran. 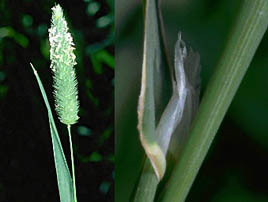 Repeated use of ACCase inhibiting herbicides during the last two decades to control this weed has resulted in the appearance of populations of P. minor that are resistant to the aryloxyphenoxy propionates (APP) in some wheat fields of the country. Dose-response assays were conducted to investigate the level of resistance in two P. minor populations (AR and MR4) which have developed resistance to three APP herbicides, including diclofop-methyl, fenoxaprop-P ethyl and clodinafop propargyl. A high level of resistance in these populations may be due to the presence of an altered ACCase enzyme in these plants, and we hypothesised that one or more mutations in the gene encoding ACCase enzyme are responsible for insensitivity of the enzyme. Results confirmed that resistance in both populations was target site-based, and molecular studies revealed that substitutions of Trp-2027-Cys and Asp-2078-Gly, respectively in AR and MR4, are responsible for insensitivity of the enzyme in these populations. This is the first report to show that these substitutions endow resistance to APP herbicides in P. minor, though other resistant biotypes are reported from elsewhere. These mutations may result in resistance of P. minor to some DIM and DEN herbicides. It seems that lack of adequate herbicide and crop rotation has selected plants with different target site mutations, which cause differential responses of the ACCase enzyme to ACCase inhibitors. Additional resistance management practices may be necessary to prevent ACCase-inhibiting herbicides from becoming ineffective over wide areas..
Travlos, I. S.. 2012. Evaluation of herbicide-resistance status on populations of littleseed canarygrass (Phalaris Minor Retz.) from Southern Greece and suggestions for their effective control. Journal of Plant Protection Research 52 : 308 - 313. In 2010, a survey was conducted in the wheat fields of a typical cereal-producing region of Greece to establish the frequency and distribution of herbicide-resistant littleseed canarygrass (Phalaris minor Retz.). In total, 73 canarygrass accessions were collected and screened in a field experiment with several herbicides commonly used to control this weed. Most of the weed populations were classed as resistant (or developing resistance) to the acetyl-CoA carboxylase (ACCase)-inhibiting herbicide diclofop, while resistance to clodinafop was markedly lower. The results of the pot experiments showed that some of the canary populations were found to have a very high level of diclofop resistance (resistance index up to 12.4), while cross resistance with other herbicides was also common. The levels of resistance and cross resistance patterns among populations varied along with the different amounts and times of selection pressure. Such variation indicated either more than one mechanism of resistance or different resistance mutations in these weed populations. The population which had the highest diclofop resistance level, showed resistance to all aryloxyphenoxypropinate (APP) herbicides applied and non-ACCase inhibitors. Alternative ACCase-inhibiting herbicides, such as pinoxaden remain effective on the majority of the tested canarygrass populations, while the acetolactate synthase (ALS)-inhibiting herbicide mesosulfuron+iodosulfuron could also provide some solutions. Consequently, there is an opportunity to effectively control canarygrass by selecting from a wide range of herbicides. It is the integration of agronomic practices with herbicide application, which helps in effective management of P. minor and particularly its resistant populations..
Muhammad Yasin ; Zafar Iqbal ; Safdar, M. E. ; Abdul Rehman ; Amjed Ali ; Muhammad Asif ; Asif Tanveer ; Pervez, M. A.. 2011. Phalaris minor control, resistance development and strategies for integrated management of resistance to fenoxaprop-ethyl. African Journal of Biotechnology 10 : 11802 - 11807. Phalaris minor (Littleseed canary grass) is a very important and annual weed of winter cereal crops. It is a very competitive weed of wheat, oat and barley crops in Pakistan. Usually, three aryloxyphenoxypropionate herbicides, fenoxaprop-P-ethyl, diclofop-methyl and clodinafop-propargyl are used as chemical weed control against different grassy weeds like P. minor, Avena sativa and Cyperus rotundus L. This review describes fenoxaprop-ethyl, a selective chemical herbicide used to control P. minor in wheat crop. High production of wheat is associated with its continuous use. But this practice enhances the development of resistant biotypes of P. minor. Different management approaches like preference of mechanical weeding over chemical weed control, integration of competitive varietal selection, crop rotation and herbicide rotation can be long duration strategies of resistance management in P. minor. However, tillage method, planting time, method of herbicide application, optimum dose, higher seed rate, early sowing, bed planting, stale seed bed and zero tillage are short duration resistance management strategies. Use of water extracts of herbicidal potential (allelopathic) plants can be effective integrated management of herbicide resistant against P. minor in wheat and for eco-friendly and sustainable weed management..